Meet the Characters in Borders of the Heart by Chris Fabry – Must Read! When you pick up this book and hold on to your seat, because you’re in for a suspenseful ride in this part thriller-part romance that includes chilling realities of the activities of drug cartels. Equally, it is a great story of coming to the end of yourself, letting go, sacrifice, finding love and redemption, and finding God’s plan for your life. Believable characters and exceptional story-telling make this a must-read. John David “JD” Jessup – Emotionally damaged from the loss of the love of his life, JD relocates to the Tuscon area to learn about organic farming. Having given up on God, he relies on himself. By choice, he finds himself living in an old rundown schoolhouse, sharing his living space with cattle feed, while learning about farming. The events that follow his discovery of a Mexican woman near death on the farm where he works will change his life forever. Maria – This beautiful, petite, and gutsy woman who held more secrets than JD could imagine, entrenched his heart, which prompts him to risk his life to save her from whomever would take her life. The killer was tracking her—and him. But, how? What conundrum would reveal the reason for the events taking place, and how could they foil the tracker? Gabriel Matos Muerte had an evil plan, and there wasn’t anyone anywhere who could contain him, not even his boss, Sanchez. Consumed by greed and the love of power, he would stop at nothing to accomplish his goal. Slocum, the farmer for whom JD worked, had no use for illegal immigrants and his stance was that all who were discovered anywhere his farm were to be turned in to the authorities. But then, there came an opportunity for him to use this “illegal” for his own benefit. Would he succeed? Harlan “Win” Winslow saw something in JD that the man himself didn’t even recognize. Win believed in JD and his motives for helping Maria, to the point of putting himself and his family in danger. Win knew God was in control and wouldn’t allow anything to happen that was not according to His plan. 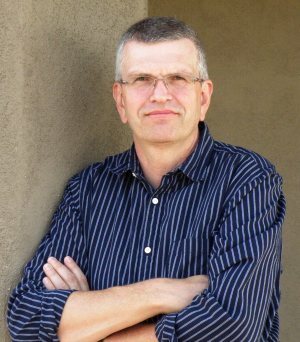 Author Bio: Chris Fabry, an award-winning author and radio talk show host, is a fresh voice in Christian fiction. He hosts the daily program Chris Fabry Live! on the Moody Broadcasting Network and was honored with the 2008 Talk Personality of the Year Award from the National Religious Broadcasters. He can also be heard daily on Love Worth Finding, featuring the teaching of the late Dr. Adrian Rogers, and weekly on Building Relationships with Dr. Gary Chapman, which he co-hosts with his wife, Andrea. Fabry’s adult novels— Dogwood, June Bug, Almost Heaven, and Not in the Heart—have won two Christy Awards and an ECPA Fiction Book of the Year Award, but it’s his lyrical prose and tales of redemption that keep readers returning for more. He has also published more than 65 other books, including nonfiction and novels for children and young adults. A 1982 graduate of the W. Page Pitt School of Journalism at Marshall University and a native of West Virginia, Chris and his wife, Andrea, live in Arizona and are the parents of nine children. Learn more about Chris Fabry on his website: www.chrisfabry.com. Q: Your newest novel, Borders of the Heart, addresses heavy topics such as illegal immigration, the U.S./Mexico drug trade and the cost of compassion. Where did you get your inspiration for the book? A: Our family moved to Arizona in 2008 and since then I’ve known I wanted to write about this area of the country, a rich, desert existence with problems and possibilities. This book is not as much an “issue” book as it is a book about people who have to deal with lots of those issues as part of their daily lives. I don’t have an ax to grind on the topics, but I did want to show how real people are affected by these contemporary topics. Q: Several of the characters in Borders of the Heart are dealing with things from their past. What lessons do your characters learn along the way? A: The past is huge for each of us. I’m convinced many are “stuck” by something in the past that holds us back from being all God wants us to be. A reader will walk through that process with the main character, J.D., and I’m hoping they’ll see an authentic struggle. Q: J.D. Jessup is faced with a very difficult moral dilemma when he weighs the decision to follow his boss’ very clear direction or his own heart when he discovers Maria near death. What lessons does this story provide for your readers? A: Every choice we make in life comes with a cost. If we say yes to one thing, we may have to say no to something else. The choice J.D. makes is a good choice, and even good choices can lead to disastrous and deadly results. Can you believe that God is involved in even the difficult circumstances? I think that’s a huge reveal in this story for me. Does everything have to work out perfectly in the end in order for God to be glorified? Q: How does the concept of redemption figure into your story? Was it gratifying to write about redemption? Why or why not? A: A lot of people don’t like the word “saved.” It’s old fashioned and not in vogue. I think the term is loaded with truth because if you’re on the verge of death and someone “saves” you, you know exactly what that means and how grateful you would be. Characters in this story get rescued from certain death and when the stakes are that high, I can’t help but get emotionally involved in the story. Q: How does the concept of grace figure into your story? Was it gratifying to write about grace? Why or why not? A: Grace is when we’re treated better than we deserve. Yes, characters discover that in the book as well. I love the concept of grace in such a gritty, tough story because you’re not expecting it. You’re expecting A+B=C and when grace invades, it catches you by surprise. Q: Borders of the Heart clearly demonstrates that sometimes there is a cost to compassion. What made this an important story element for you? Why was it important for you to show that sometimes there is a cost for us when we behave compassionately? A: You’ve heard the saying, “Freedom isn’t free.” The one who acts with compassion usually absorbs the pain of someone else. This is a picture of the cross, of the sacrifice made for us in Christ. This is another thread you’ll discover throughout the story. Q: Have you ever been faced with a real-life hard choice or ethical dilemma like your main character J.D.? If so, what was your dilemma and did you feel like you made the right choice? A: I’ve never had to decide whether to leave a person for dead or not, but I think every day we have a chance to sacrifice. Sometimes it’s a small thing, like taking time for your children when you have something REALLY important, like writing a few more paragraphs. I haven’t always passed those tests. My contention is, the details of everyday life will show what we’ll do with the big decisions. If you choose well in the small moments, the moments when no one is looking, you’ll choose well when a huge decision comes your way. Conversely, if you don’t see the little things as important, you might not make a good decision with the big decision. Q: What do you hope your readers will take away from reading Borders of the Heart? A: Borders of the Heart is at its core a love story. You will root for J.D. and Maria to survive and solve the mystery of what’s really going on in Tucson. And I hope readers will take away the truth that what looks impossible to people is possible with God’s power. Even if something looks hopeless, it’s really not when God is involved. 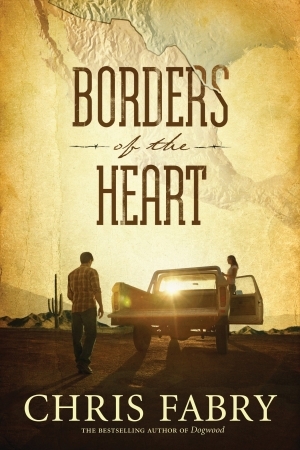 Borders of the Heart released on October 1st and is available at your favorite bookstore or from Amazon.com, Barnes & Noble, and Christianbook.com. This entry was posted on Friday, October 19th, 2012 at 8:16 PM and is filed under BOOK REVIEWS. You can follow any responses to this entry through the RSS 2.0 feed. You can leave a response, or trackback from your own site.